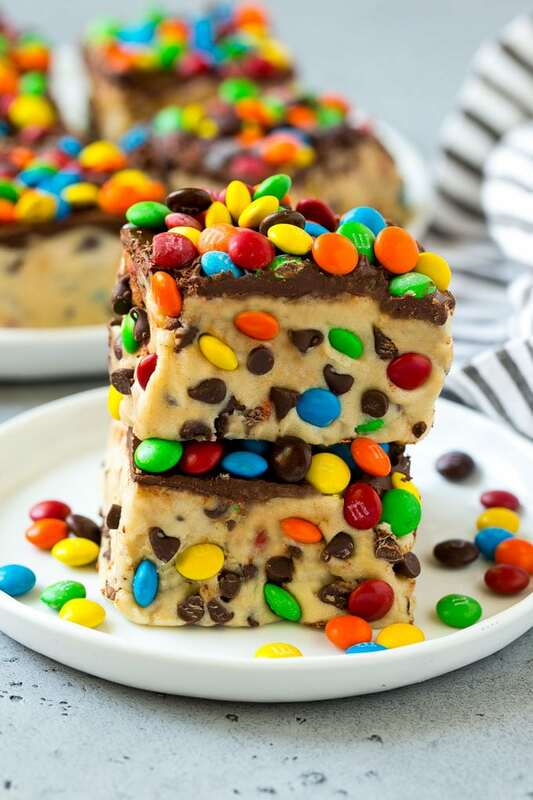 These cookie dough bars are edible cookie dough filled with chocolate chips and M&M’s, then topped with more chocolate and candy. A fun and unexpected dessert that takes just minutes to put together! Love cookie dough? Me too. 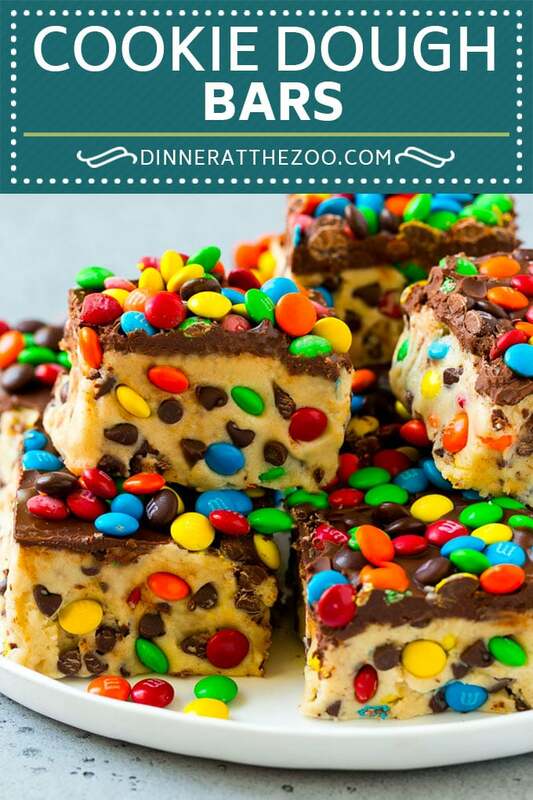 These cookie dough bars are a handheld version of the classic treat. They’re great for birthday parties, after school snacks or just for when you get a cookie dough craving. Want cookie dough in a hurry? Try my cookie dough dip! I have to admit, I think I might possibly like cookie dough better than I do the actual baked cookies! These cookie dough bars are rich, creamy and loaded with chocolate. They’re egg free so they’re safe to eat and are always a total crowd pleaser. 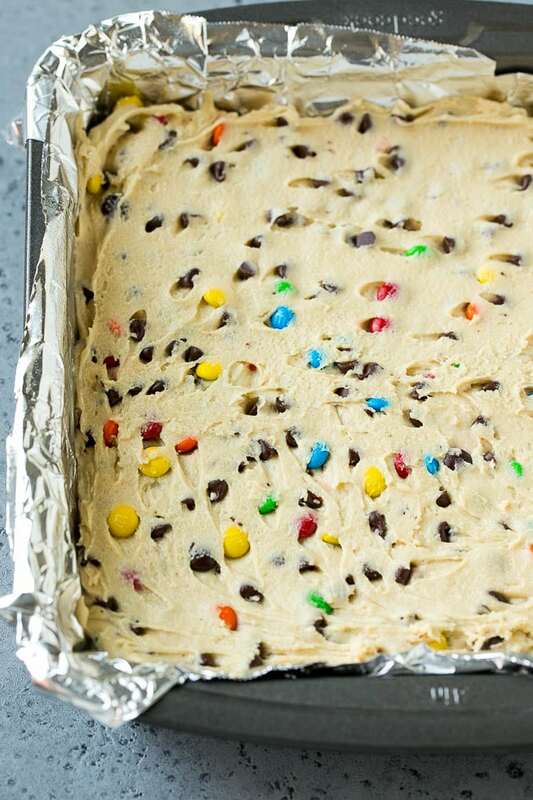 How do you make cookie dough bars? These cookie dough bars are made with butter, flour, brown sugar, and sweetened condensed milk. 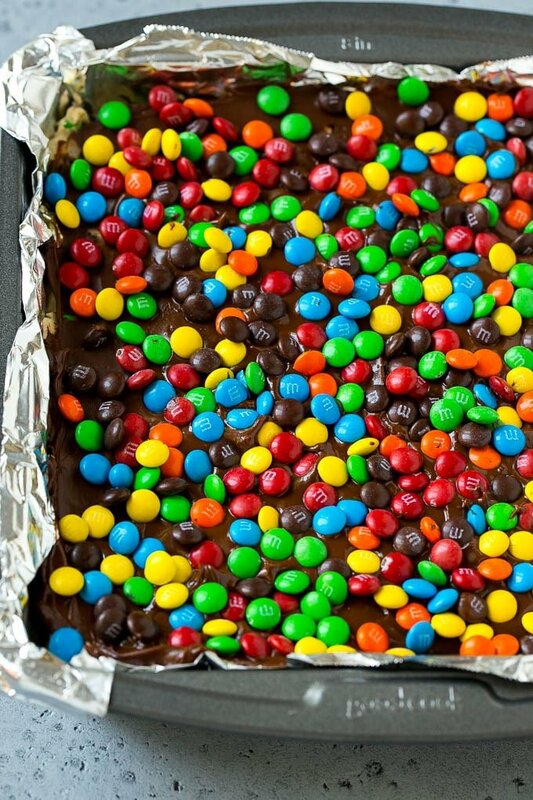 Everything gets mixed together before miniature chocolate chips and M&M’s are folded in. The cookie dough mixture gets pressed into a pan before it goes into the freezer to chill. I use an offset spatula to smooth out the top of my cookie dough bars so that they are even. You want your cookie dough to be completely firm before you add the chocolate topping. Can you eat raw cookie dough? Technically you should not eat raw cookie dough because it contains raw eggs and raw flour, both of which can potentially make you sick. This cookie dough bar recipe is egg free and you can bake your flour in the oven for 5 minutes to make it safe to eat. These cookie dough bars are on the softer side, just like real cookie dough. I recommend storing them in the fridge until you’re ready to serve them. These bars also happen to freeze well! Cookie dough bars are fairly rich, so I like to cut them into small squares. You could easily turn this into a Christmas recipe by using red and green M&M’s instead of rainbow colored and adding a handful of holiday sprinkles into the mix. 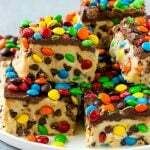 I love to serve cookie dough bars at parties, class events and for an extra special after school snack. These bars are adored by kids and adults alike! 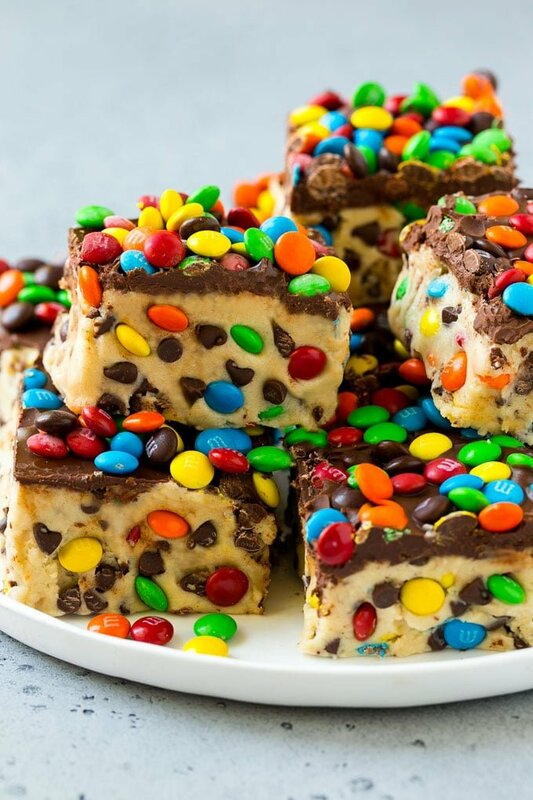 These cookie dough bars are edible cookie dough filled with chocolate chips and M&M's, then topped with more chocolate and candy. A fun and unexpected dessert that takes just minutes to put together! Line an 8"x8" square pan with parchment paper or foil. Coat the parchment paper with cooking spray. For the cookie dough: Place the butter and brown sugar in the bowl of a mixer and beat until fluffy. Add the vanilla and beat for one more minute. Alternate between adding the flour and condensed milk, mixing on low speed until everything is combined and a dough forms. 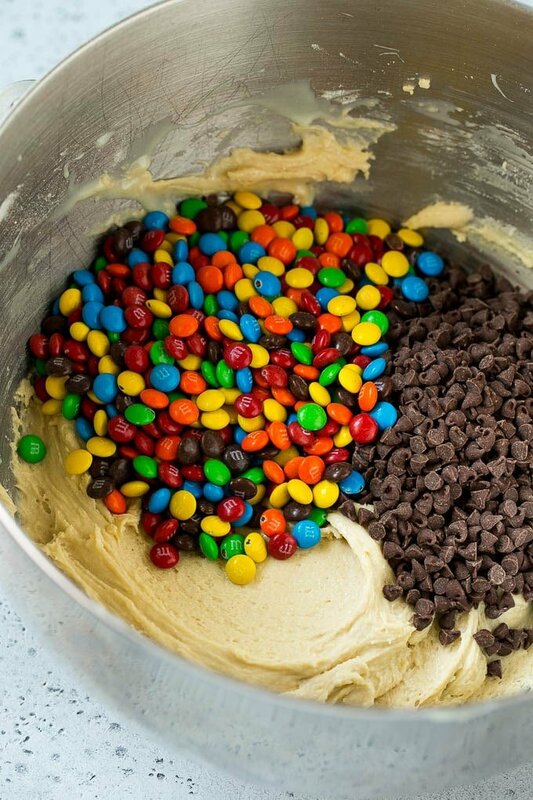 Stir the chocolate chips and M&M's into the dough. Spread the dough in an even layer in the prepared pan. Place the bars in the freezer for 30 minutes. To prepare the topping: Place the chocolate chips and butter in a bowl and microwave in 30 second increments until melted. Stir until smooth. Spread the chocolate evenly over the cookie dough layer. Press the M&M's into the chocolate. Chill the bars in the fridge for at least 2 hours. Keep chilled until ready to serve, then cut into squares and enjoy. Store any leftovers in the fridge. To make the flour safe to eat, spread it out onto a baking sheet and bake at 350 degrees F for 5 minutes.